When Kevin first came to live with Jarid Banks and his family, the Banks couldn’t help but wonder where a nine-year-old could pick up such a shocking vocabulary. After seven years with the Banks family, however, foul language isn’t the only challenge Kevin has learned to manage. 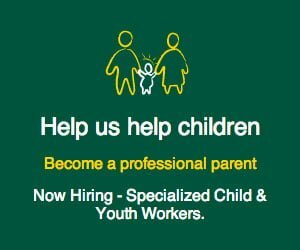 Jarid is a foster parent (what we call a Parent Therapist) with Quinte Children’s Homes (QCH), a program that offers specialized care for foster kids who need additional support. QCH follows a different model of care that combines a clinical approach with a family environment. As a child Kevin was cared for by a relative, but over time they took less of a role in his life. With that extra support, Jarid says Kevin has been able learn important life skills that move him closer to a more independent lifestyle. “Kevin will likely always need someone to look after him,” Banks explained. However, over the past few years he has taken significant steps forward. Where he once had 60 suspension days in the school year, this year he had just eight. He is better at managing his aggression and has learned that he’s good with his hands. Quinte Children’s Homes specializes in the child-focused model of care that it takes to help youth like Kevin reach their highest potential. To learn more about our program and how you can get involved, please contact us directly or connect with us on Twitter.